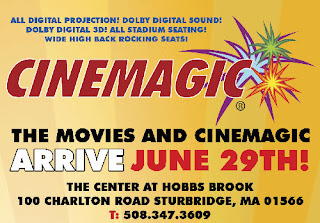 Thinking Out Loud In Sturbridge: Welcome Cinemagic! It's been a good busy so far this summer. It's also been a bit of a stressful past month and a half, as well. Yes, there have been some challenges on the home renovation front, and, as of today, we are are a bit closer to resolving all the problems. Hopefully, this cluster flub of a home improvement project will be completed by next weekend. In the meantime, Mary and I needed to relax. Chill. Take five, and today we did. We took in a movie. Nothing new there, but this time we did it in Sturbridge!! We went to the movies in Sturbridge!! At a real eight screen, multiplex, Dolby 7.0 surround sound, digital picture cinema!!! No more trips to the Blackstone Valley Cinema. They are fine, in fact, they are great, but the new Cinemagic multiplex at the Hobbs Brooks Plaza is three miles from our house, surrounded by shops, and restaurants we use all the time. Today we took in "Madagascar 3". The folks behind the popcorn counter were learning, and friendly. The ticket taker was friendly, and learning, as were the ushers. I think their average age was eleven, or maybe it is me that is just older, and anyone younger than twenty looks eleven. No matter, they were nice, and we were well received. Supporting the local business is a simple step anyone can do to help fix the economy. If we can eat, shop, and be entertained within a few miles of our homes, why not? It was the entertainment factor that has been missing here in town for some time, but today, it is back. The neat thing is I can go to Walmart, pick up a box of trash bags, then take in a movie. 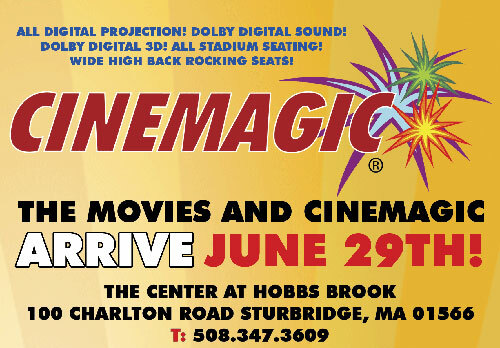 Welcome to Sturbridge, Cinemagic. I know we'll be getting to know one another real well. Where is the theater's marquee? There's not much of an attraction there for tourists, or for me either, without a marquee to list the movies!